A Koi pond can be one of the best retreats available. The chance to simply relax and appreciate the beauty that is so unique to these living jewels. We offer an extensive line of water treatment products and test kits to enable you to maintain a quality environment for your Koi. All kits feature and easy to colour match plastic acetate card and are supplied with non-degradable foil sealed tablets. 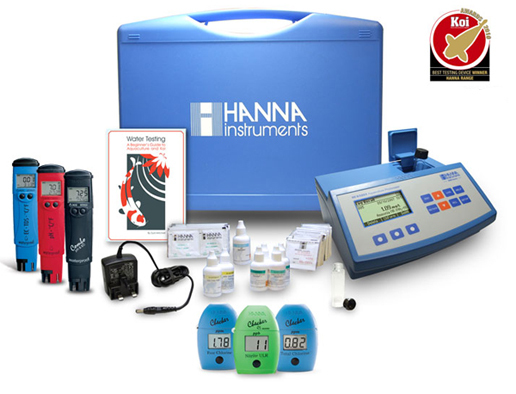 Hanna electronic Ion specific meters work using ion specific chemical method, in other words like simple test kits, a chemical is added and a colour is formed and the electronic meter reads the results very accurately in mg/l down to 2 decimal places I.E. 0.01mg/l special reagents (chemicals) are required for each parameter. Trans Instruments has specially designed the KoiMedic tester to measure the delicate salt concentration in the pond. Testing your water is important, we offer an extensive line of test kits to enable you to maintain a quality environment for your Koi.